This was a really interesting read. I honestly had no idea how a steel was made. I wonder if it’s still done the same way. A WORLD without steelâ€”try to imagine it! Without steel, the whole physical structure of the modern world would collapse. Lacking this one all-important substance, the civilization we know would cease to exist. There was, of course, civilization long before the discovery of steel, but it was vastly different from ours; so different that it requires an effort of the will to picture a world without steel. There would be no buildings higher than walk-up distance; no airplanes, no automobiles, no modern railways or fast steamships. Foodstuffs would be largely limited to what could be grown locally, and the threat of famine would be ever present. The horse and the sail would still be the principal means of transportation. There would be no modern factories, industry, cutting tools, or power machines. Countless features of the twentieth century world would be non-existant. The United States would be back in the era of the horse and buggy. The changes wrought by steel have been so vast and staggering that it is difficult to realize that the Steel Age is comparatively young. As recently as 1880, it was still gaining momentum. It wasn’t in full swing until 1900, and its peak is not yet in sight. Iron and steel were known before the Steel Age began. The first iron on record was placed in an Egyptian pyramid more than 5,000 years ago. The Romans used a lot of it, but with their methods of production a ton of raw iron would cost $1,000. Today the average price of finished steel is only $55 a ton. A medieval furnace could produce 100 to 150 tons of iron a year. A modern blast furnace produces 600 tons a day. A hundred years ago a blast furnace consisted of a stack and a blower. Charcoal was the only fuel, and the bog ore was hand selected. The chief customers for the 25 or 30 tons produced a week were the nearby blacksmiths, who hammered out ferrous products by hand. In those days the principal metals were cast and wrought iron. Cast iron was hard but brittle. Wrought iron resisted shock but was soft. Steel was needed, for steel is strong, wear-resisting, and tough. There was blister steel and crucible steel, but the methods of making them were slow and costly, and totally incapable of producing the metal in quantity. Blister steel was produced by placing charcoal and wrought iron into clay boxes or jars, and heating for days, until the iron had absorbed enough carbon to become steel. Crucible steel was melted in a pot, along with carbon. 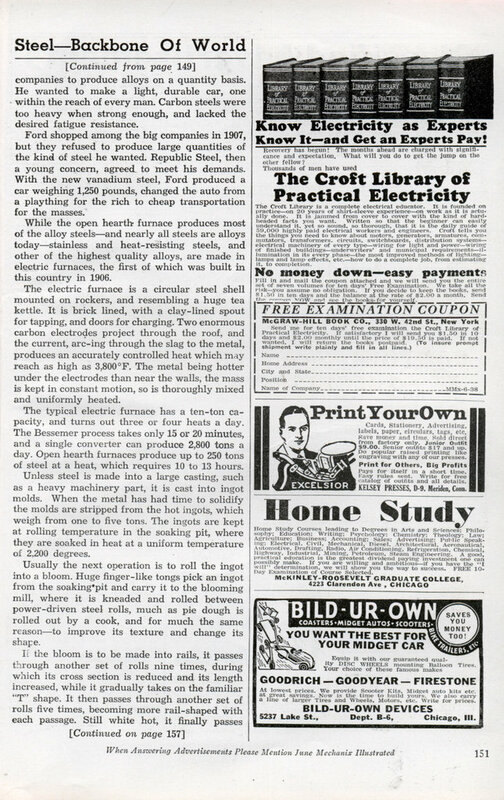 The method gave us the famous Sheffield steels, excellent but rare and costly. Ninety years ago Henry Bessemer of England and William Kelly of Kentucky, working independently, conceived the idea of refining iron by blowing air through it. Bessemer patented the process in 1855, but Kelly erected the first commercial converter two years later. The two interests merged in 1866, and became generally known as the Bessemer process. A Bessemer converter is a huge, pear-shaped vessel made of steel plates and lined with heat-resisting brick. It is open at the top and mounted on hollow trunnions so it may be tilted. The base is perforated, so that air blown through the trunnions passes through these holes to bubble through the metal. In operation the converter is tilted on its side and filled with from 10 to 25 tons of molten pig iron. The rush of air, turned on as the converter is returned to a vertical position, prevents the metal from running through the holes. As the blast is turned on a brilliant shower of sparks bursts from the mouth of the converter, to be followed at once by short, ruddy flames, and a cloud of reddish fumes as the silicon and manganese combine with the oxygen and burn. The ruddy flames gradually change to a yellowish white tongue of fire as the carbon in the iron burns; and for about ten minutes the sky is lighted up for miles, while the converter emits a deep roar from the boiling mass of metal. Suddenly the flame drops, and the converter is tilted again before the iron can burn. Ferro-manganese is added to the molten mass to absorb the gases and kill the boiling action. This ferro-alloy furnishes the metal with the desired proportions of carbon, sulphur, manganese, phosphorous and silicon, turning it into steel. When the alloy has had time to do its work, the converter is tilted still further, and the molten mass is poured into a giant ladle from which it is teemed into ingot molds. It was this Bessemer process of refining steel cheaply and in large amounts that introduced the Steel Age. In 1890 nearly 90 percent of all steel was produced by this process. Today open hearth furnaces produce 91 percent, with Bessemer a poor second at seven percent. Bessemer steel, however, has certain definite advantages. Its high sulphur content makes it ideal for machining, for it cuts clean. It can be drawn into stiffer wire, and to finer sizes. It also makes the best welded pipe. Its low standing today is due to the demands for “tailor-made” metal, the manufacture of which can be controlled better in open hearth and electric furnaces. The coming of the Bessemer process coincided with the fever of railroad building, and greatly accelerated it. Railroads paid $80 a ton for inferior iron rails in 1867, and could secure only 460,000 tons. They paid but $32 a ton for 1,500,000 tons of steel rails in 1884, the peak of railroad building. With the growing demand for steel, it became necessary to produce raw iron in enormous quantities. Blast furnaces increased in size, until now one can turn out 600 tons of iron a day. A blast furnace is an enormous steel shell, lined with heat-resisting brick, and often 100 feet high. Alternate layers of iron ore, coke and limestone are fed in at the top, while a blast of superheated air is blown in from the bottom. The coke burns in the hot oxygen, and the whole mass settles, the iron forming a molten pool in the bottom. The limestone also melts, absorbing the coke residue and earthy matter in the ore, and forming a molten slag that floats on the iron. The slag and iron are tapped several times a day, while the charge of raw materials is constantly renewed at the top of the furnace. A furnace will operate continuously, until shut down for repairs, or because there is no longer a demand for its product. The tapped metal is cast into molds called pigs, unless it is to be used on the spot in the manufacture of steel, in which case it is taken in a ladle to a huge vat called a mixer, where it is kept in a molten state until needed. The open hearth furnace was originally designed in 1864 to produce steel without infringing on the Bessemer patents. It was 20 years later before this type of furnace was operating on a commercial basis. An open hearth furnace is a huge oven in which the hearth or floor is exposed to the sweep of the flames which melt the metal. The fuel, which may be gas, oil, tar or powdered coal, is blown in at one side of the furnace, along with heated air, through a checkerwork chamber of brick. The smoke and combustion gases pass off at the other side through a similar checker chamber. Every fifteen minutes or so the flow is reversed, so that the incoming fuel and air pass through a heated chamber. This reversal of flow conserves heat, and makes possible temperatures that could not otherwise be obtained without an enormous consumption of fuel. The open hearth may be charged with cold or molten pig iron, cold scrap, or any combination of these. Limestone is added as a scavenger. Floating on the molten metal as slag, it absorbs all impurities. Chromium, nickel, vanadium, manganese, or any other alloying elements may be added to the charge at will to produce the type of steel desired. The charging is done by enormous mechanical arms, which pick up accurately measured containers of cold materials, insert them through automatic doors, and invert them to dump their contents. Molten metal is charged by pouring from a huge ladle into a portable spout. If a housewife was to make a cake as accurately as steel is made, she would have to measure the ingredients by ten-thousandths of ounces, and single grains of sugar. She makes only a pound or two of cake; a typical open hearth furnace makes a 200-ton batch of steel at one heat. Her oven reaches a maximum of 500 Â°F. Steel bubbles in an open hearth furnace at 3,000Â°. There are now nearly a thousand varieties of alloyed steels, the ingredients of which are controlled within a thousandth of one per cent, yet prior to 1900 there was only carbon steel, with various percentages of carbon. Henry Ford is credited with forcing the steel companies to produce alloys on a quantity basis. He wanted to make a light, durable car, one within the reach of every man. Carbon steels were too heavy when strong enough, and lacked the desired fatigue resistance. Ford shopped among the big companies in 1907, but they refused to produce large quantities of the kind of steel he wanted. Republic Steel, then a young concern, agreed to meet his demands. With the new vanadium steel, Ford produced a car weighing 1,250 pounds, changed the auto from a plaything for the rich to cheap transportation for the masses. While the open hearth furnace produces most of the alloy steelsâ€”and nearly all steels are alloys todayâ€”stainless and heat-resisting steels, and other of the highest quality alloys, are made in electric furnaces, the first of which was built in this country in 1906. The electric furnace is a circular steel shell mounted on rockers, and resembling a huge tea kettle. It is brick lined, with a clay-lined spout for tapping, and doors for charging. Two enormous carbon electrodes project through the roof, and the current, arc-ing through the slag to the metal, produces an accurately controlled heat which may reach as high as 3,800Â°F. The metal being hotter under the electrodes than near the walls, the mass is kept in constant motion, so is thoroughly mixed and uniformly heated. The typical electric furnace has a ten-ton capacity, and turns out three or four heats a day. The Bessemer process takes only 15 or 20 minutes, and a single converter can produce 2,800 tons a day. Open hearth furnaces produce up to 250 tons of steel at a heat, which requires 10 to 13 hours. Unless steel is made into a large casting, such as a heavy machinery part, it is cast into ingot molds. When the metal has had time to solidify the molds are stripped from the hot ingots, which weigh from one to five tons. The ingots are kept at rolling temperature in the soaking pit, where they are soaked in heat at a uniform temperature of 2,200 degrees. Usually the next operation is to roll the ingot into a bloom. Huge finger-like tongs pick an ingot from the soaking pit and carry it to the blooming mill, where it is kneaded and rolled between power-driven steel rolls, much as pie dough is rolled out by a cook, and for much the same reasonâ€”to improve its texture and change its shape. If the bloom is to be made into rails, it passes through another set of rolls nine times, during which its cross section is reduced and its length increased, while it gradually takes on the familiar “T” shape. It then passes through another set of rolls five times, becoming more rail-shaped with each passage. Still white hot, it finally passes through the finishing rolls, a rail 120 feet long, to be cut into 32 or 39-foot lengths. Instead of rails, the bloom might become any one of the many structural shapes used in bridges and buildings. It might be rolled into billets for rods of various sizes, or into slabs, if its final form is to be sheets or strips. Many of the rods are made into wire, by drawing them through a series of dies while cold, each hole being smaller than the rod passing through it. Cast iron and alloy steel rods are used as dies for coarse wire, diamonds for the finer wires. There are 160,000 uses for steel wire, including fencing, paper clips, hair pins, guitar strings, and hairsprings in watches. There are wire springs so small it takes 83,000 to make a pound, and a ton of them is worth $200,000. And there are heavy machinery springs that require a weight of 14,000 pounds to depress them one inch. Without springs we could have no watches, no internal combustion engines, no telephone bells or window shades. The continuous strip mill, though developed within the past ten years, has revolutionized the production of flat-rolled steel. A white hot slab is fed into one end of the mill, passes through ten sets of rolls in a straight line, and emerges as a steel strip several hundred feet long, and any desired width up to 96 inches. Since each roll reduces the thickness and increases the length of the strip, each succeeding set of rolls must run faster, until the white hot steel is traveling 20 miles an hour when it emerges. Separate electric motors drive each set of rolls, and their timing must be precise to the thousandth of a second to take up the slack, and prevent the white hot strip from kinking and running wild. If hot rolled sheets are being made, the strip is run onto a table and cut to the desired lengths. If the steel is to be cold rolled, it is coiled into enormous rolls. The principal products of continuous mills are sheets for stamping and drawing auto body parts, and tinplate. The cheapness and splendid appearance of the modern motor car is possible only because of recent developments in producing cold rolled steel sheets. In 1910 an auto body had to be bent by hand around a wooden frame, then riveted, brazed or welded into place. And it took twenty coats of paint, priming, and varnish to cover up the rough surface of the steel. Today body parts are stamped out cold in huge presses, the steel now being ductile enough to stand the stresses of such stamping. Cold rolling has given a surface that requires no priming or touching up, and can be covered with two coats of enamel. It is almost entirely a matter of the quality of steel that makes the cheapest car today a far better product than the most expensive car of 20 years ago. So important has steel become in modern civilization that there are now 18,000 pounds in use for every person in the countryâ€”seven times as much as in 1900. The house you live in may have a steel frame or was cut and put together with steel tools. You sleep in a bed with steel springs, and a steel alarm clock wakens you. You don clothes made on steel looms and eat breakfast cooked in steel utensils on a steel stove. You ride to work in a steel auto, or on a steel trolley or subway train running on steel tracks. You work in a steel-supported building. You use steel tools, or your stenographer types your letters on a steel typewriter. You sign them with a fountain pen molded in steel. The food on your dinner table has been cultivated with steel implements, milled with steel machinery, baked in steel ovens, preserved in steel cans or refrigerators. It was brought to you in steel cars over steel rails, in steel ships, or in steel trucks over steel-reinforced roads. 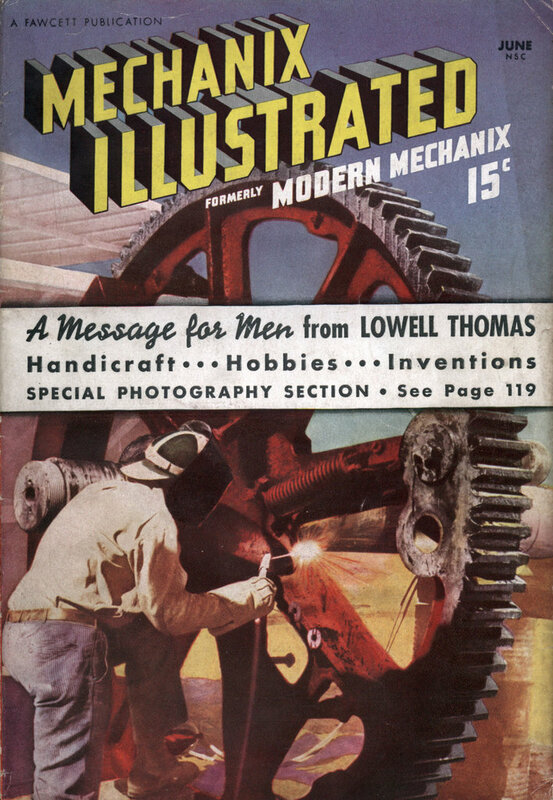 The magazine or book you read was printed on a steel press. The paper itself is made from wood, cut with steel tools, processed in steel machines. There is scarcely a phase of your life today that is not touched, improved or made possible by steel. It is perhaps the most significant factor in twentieth century civilization. Steel is the backbone of the modern world. Pretty much unchanged. There are many more variations and alloys today and considerably more automation but the rest is the same.